A sun lover's holiday paradise, Koh Samui ('the coconut island') is Thailand's third largest island resort and no longer the footloose and fancy-free backpacker's secret hideaway it once was. Koh Samui now rivals Phuket as one of Thailand's most popular holiday destinations, with regular flights arriving at its own airport disgorging keen holidaymakers. 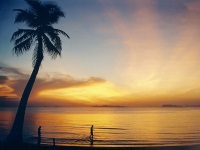 There are a range of accommodation options on Koh Samui, from modest beach bungalows to luxury holiday resort hotels. The island still retains its laid-back atmosphere though, with friendly locals, good food and some not-too-commercial local attractions, like a crocodile farm and butterfly garden, to keep visitors entertained. Night time is party time with open-air discos and music bars throbbing in the darkness. There are three main areas for shopping on Koh Samui: Nathon, Chaweng and Lamai, but all towns on the island offer shopping. Nathon is the main shopping centre, the town where the ferries arrive. Goods from all over Thailand are available, as well as traditional souvenirs like silk scarves. Chaweng and Nathon are excellent places to have clothes made by local tailors, while Chaweng and Lamai are the towns to find good quality western-style shops. Most towns have night and day markets, always intriguing regardless of whether one buys anything or not. Koh Samui is highly regarded for its superb and abundant dining options, from excellent Thai cuisine to seafood, and a growing number of restaurants around the island offer a wide variety of international food and other specialities. Many restaurants have begun serving customers right on the beach for a truly scenic and tropical experience. Chaweng Beach has a large concentration of good international restaurants, while many of the best Thai restaurants are found in Lamai. The nightlife on Koh Samui is rated among some of the best in Thailand with discos, cabaret shows, clubs and pubs, many of which are open till sunrise, and located mainly in Chaweng and Lamai. Chaweng is the most popular area for nightlife, featuring everything from outdoor music bands to stylish nightclubs. Lamai caters for a slightly older crowd, but also has numerous music venues and bars. The top discos on the island are the Green Mango and Reggae Pub (Chaweng), and the Swing Bar (Lamai). There are also opportunities to watch classical Thai dancing, mud wrestling and Thai boxing. Beach parties with fireworks displays also occur regularly. As an internationally renowned diving spot, Koh Samui offers a wide range of diving and snorkelling facilities and tours to enjoy on holiday. The largest concentration of dive schools in Koh Samui is in Sairee Beach (Koh Tao), Bophut Beach and Chaweng Beach (Koh Samui). The most popular dive sites are Chumphon Pinnacle and Sail Rock, however most are within range of a full-day excursion from Samui. Diving is year-round in Koh Samui, however windy conditions between October and December can decrease visibility. If the beaches, watersports and underwater marine life are not enough, the island offers a variety of other activities and attractions, from elephant trekking to Thai cooking classes. For the less active, Samui also has wellness centres, places to learn yoga, alternative therapy centres and wonderful spas that exist for pure indulgence. Koh Samui's popularity as a holiday destination has resulted in overcrowding, and some might say an over-abundance of bars and street sellers.